While there is still about a month and a half left of vehicle sales in the calendar year, you could pretty much say that this race is over! We are proud to announce that the Honda Civic has already generated enough sales in 2015 for it to cement itself at the top of Canada’s list of best selling cars – for the 18th CONSECUTIVE YEAR. The Civc of today is much different than the one that Honda started selling when the streak began in 1998. But throughout the years, Honda has made a name for itself by continuing to build a reliable car with amazing resale value and a sharp look. While you could call the Civic an “entry level” car, it doesn’t feel, nor does it look like one – and it certainly doesn’t drive like one! The 2015 title didn’t come all that easily for the Civic, however. In this year’s first-quarter, the Civic was Canada’s top-selling car for just a single month: March. The Toyota Corolla, the Civic’s traditional rival, gave it a good run for it’s money but ultimately fell short, and by the middle portion of the year the Civic has regained it’s momentum. As we’ve talked about before, Honda has just released their 10th-generation, 2016 Civic. More interior space, new engines, and the eventual debut of a hatchback model should help Honda gun for their 19th consecutive year of being Canada’s best selling car. 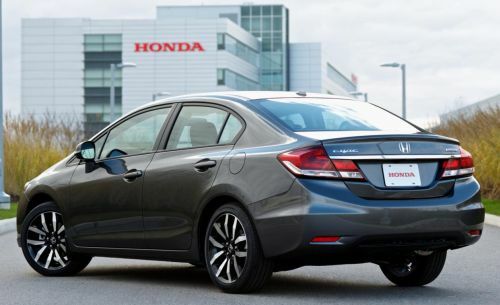 With this new car on Honda lots across the country already, look for it to also help the sales of the 2015 model. Which in turn, would help it close out it’s 2015 with a bang! If driver’s don’t want the most current model or upgrades, they can take advantage of the great clear out deals that Honda offers. Stop by Henley Honda and take a 2015 or 2016 Civic for a spin, and you’ll understand just why this is Canada’s best selling car for 18 years in a row!